No one embodies the rollicking spirit of great Southern party giving more than Julia Reed, the consummate hostess and go-to food and lifestyle expert. For this book, she offers up a feast of options for holiday cocktails, spring lunches, formal dinners, and even a hunt breakfast. Eleven seasonal events feature delicious, easy-to-prepare recipes, ranging from fried chicken to Charlotte Russe and signature cocktails or wine-pairings—she introduces her talented friends (rum makers, potters, fabric designers, bakers) along the way. Each occasion includes gorgeous photographs showing her original approach to everything—from invitations and setting a table to arranging flowers and creating the mood. Reed also provides practical considerations and sources. This irresistible book is the ultimate primer for every party-giver. Journalist and author Julia Reed is a contributing editor at Garden & Gun and Elle Decor. She writes a column for Southern Living, contributes to the Wall Street Journal, and is the author of five books including But Mama Always Put Vodka in Her Sangria and One Man’s Folly: The Exceptional Houses of Furlow Gatewood. Paul Costello is a lifestyle photographer. His work has appeared in many publications and books including One Man’s Folly and Miles Redd’s The Big Book of Chic. "Celebrate the spirit of the Southern party with Julia Reed, who introduces us to a host of entertaining options including cocktails, formal dinners, lunches and many irresistible seasonal events." "Julia's recipes are simply written, soulful and entertaining; her readers will want to cook every night of the week. Not to mention, her anecdotes about life in the South make you dream of sitting down at Julia's table." "Julia Reed is the quintessential Sothern doyenne. Her love of hound dogs, biscuits, and a great yarn is a tell-tale sign of her devotion to her roots. Paul Costello’s gorgeous images showcase the South and its patrons in all their glory." "I am having a hard time resisting the urge to lick and nibble on this book. Everything looks so gooood." 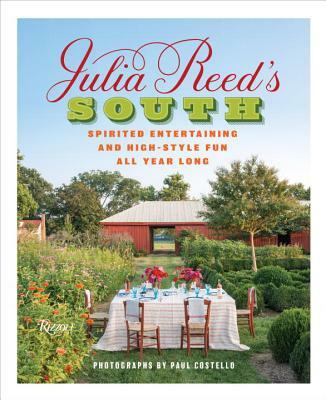 "Julia Reed’s South: Spirited Entertaining and High-Style Fun All Year Long, is a gathering's guide for all seasons, with eleven full menus for events as varied as a springtime lunch and a dove season breakfast. Whether your taste in entertaining skews toward the formal rib-eye roast or the pink rum drink, this book covers it." "Julia Reed's South: Spirited Entertaining and High-Style Fun All Year Long is a gorgeously packaged, 224-page tome, with 150 envy-and-hunger-inducing photos by photographer Paul Costello. . . From a sandbar picnic in Mississippi and citrus laden Christmas cocktail supper in New Orleans to formal dinners for Visiting Dignitaries and lovely spring luncheons al fresco, Reed invites us into her life, introduces us to a list of her talented friends - including chefs, writers, artists and designers - and, most importantly, delivers a stellar source list, worth well over the $50 price tag on the book." "Complete with table settings and recipes - heirloom damask tablecloths, deviled-ham gougères - Julia Reed's South is a delicious romp through a year's worth of the prolific writer's legendary soirees." "I must tell you about one of my favorite Spring book releases: Julia Reed's South. . . It's refreshing to see tables, sideboards, and entire rooms, for that matter, decorated with antiques, practically a novelty these days. But not every party is quite so dressy. In fact, that's the charm of Julia's book. The author is a down-to-earth Southern cook who knows that sometimes, the best fried chicken comes from the neighborhood grocery store and that for some dishes, crushed Ritz crackers make an excellent crumb topping." "Julia Reed's South: Spirited Entertaining and High-Style Fun All Year Long is an informative and down-to-earth guide to giving an unforgettable party, and includes secrets she has collected over a lifetime. . . Each occasion includes gorgeous photographs showing her inspiring approach to everything from invitations and setting a table to arranging flowers and creating the mood." "In Julia Reed's South: Spirited Entertaining and High-Style Fun All Year Long, the Mississippi native takes readers on a journey through the South she knows best, by way of 11 mealtime parties with family and friends in Louisiana, Georgia, Virginia, and beyond. . . Reed's South is warm, funny and magical." "She’s hosted picnics on Mississippi River sandbars and dinner parties on hundred acre plantations. She’s served everything from buckets of fried chicken to lamb bourguignon and scalloped oysters. When she’s not throwing an unforgettable soiree or preparing the best blackberry cobbler you’ve ever tasted, she’s writing about it. Julia Reed is Southern Hospitality. In her new book, Julia Reed’s South: Spirited Entertaining and High-Style Fun All Year Long, Reed opens up her hospitality playbook, sharing stories, recipes and tips for bringing together friends and family with a serious dose of fun."